By Zhang. Posted 2010-05-08 at 16:59. Filed under Electronica. Permalink. Subscribe to this post’s comments. Both comments and trackbacks are currently closed. 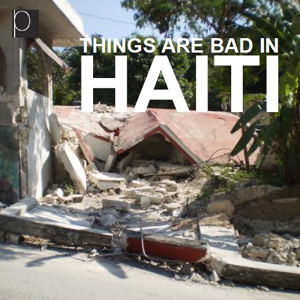 As some of you know, our label has a special connection to the earthquake ravaged country of Haiti – so in the tradition of our charity net releases we quickly pulled together this compilation to help out. Thanks to our regular contributors and everybody who responded so quickly. Luckily, all of our family in Haiti are safe, but as you can imagine, the damage to their homes was devastating, forcing the majority of them had to temporarily relocate to Florida, the Dominican Republic or other regions of Haiti where they are sharing housing and other resources. Needless to say, getting our family’s lives back to normal requires money for the basics: food, water, clothing, as well as the resources to build new housing. This is why we’re dedicating this release’s proceeds entirely to the Haiti relief cause. When you download this Pertin-nce release you can make a donation via paypal at account [bleupulp (at) hotmail (dot) com] and use reference ”pertin-nce_031”. All of these proceeds will go directly to members of our family in need. If you’d rather not give money directly to individuals, we also encourage you to give to an organization of your choice. Thanks and enjoy our latest collection of music! Unknown Language is the second album of Eniac (Fabio Battistetti). 9 tracks (2 remix) representing Eniac’s language in 2010.